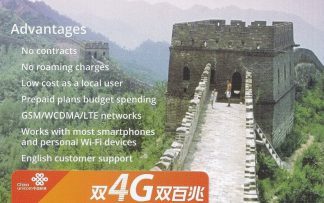 Buying China SIM cards in China is difficult for travelers due to language barriers, national roaming charges, the lack of International calling on most cards and the sometimes high cost to call India. Beware also of the occasional scams! Most Chinese SIM cards are regional, which means if you travel to a different province you’ll pay higher rates, so try to buy a SIM card in the province where you’ll be spending the most time. SIM card information related to Beijing will be discussed below. SIM Cards are sold everywhere in Beijing. You can buy a SIM card right at the airport. Alternatively, they are available in departmental stores, bookstores, post office, and sometimes on the street. The value of the card is stated clearly on the card, and that’s how much they sell it for. You might get a SIM card from a retail store on street, but you still have to go to the service point of the carrier for official registration and activation before using it. A real name registration policy for mobile users in China , requiring national and tourists to show their national identification card or passport and complete a registration form when purchasing a new SIM card to activate mobile services. When buying a SIM card in Beijing ask whether the SIM card allows you to call outside China. Some SIM cards allow this to happen, while others don’t. Most prepaid sim cards have international calls disabled unless you top up certain amount of money (500 Yuan for China Unicom) and then call China Unicom 10010 to enable international call. Usually cards that allow you to call outside of China will not allow you to send text messages out of China. There are some MVNO as well such as Mi-mobile. SIM cards are only available online to be sent to a Chinese address and registration can be made only with Chinese IDs. That’s why they aren’t suitable for tourists. Out of Beijing：The same as above on condition buying a good bag or Add extra 0.15￥/min without a good bag. Please top up 158 ￥/month to the SIM card to get above packs. Please top up 166 ￥/month to the SIM card to get above packs. Please top up 169 ￥/month to the SIM card to get above packs. * You can switch on International Calling only when your balance is over certain amount, but once this service is switched on, you can make an international call even if your balance is less than this amount. We can get you a China SIM Card that avoids all these difficulties, click below! Click here to see all available options for China!